The type II iodothyronine deiodinase (D2) is a type I endoplasmic-reticulum (ER)-resident thioredoxin fold-containing selenoprotein that activates thyroid hormone. 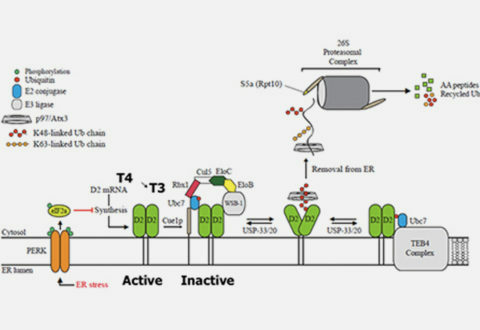 D2 is inactivated by ERassociated ubiquitination and can be reactivated by two USP-class D2-interacting deubiquitinases (DUBs). Here, we used D2-expressing cell models to define that D2 ubiquitination (UbD2) occurs via K48-linked ubiquitin chains and that exposure to its natural substrate, T4, accelerates UbD2 formation and retrotranslocation to the cytoplasm via interaction with the p97-ATPase complex. D2 retrotranslocation also includes deubiquitination by the p97-associated DUB Ataxin-3. Inhibiting Ataxin-3 with eeyarestatin-I did not affect D2:p97 binding but decreased UbD2 retrotranslocation and caused ER accumulation of high molecular weight UbD2 bands possibly by interfering with the D2:USP binding. Once in the cytosol, D2 is delivery to the proteasomes as evidenced by coprecipitation with 19S proteasome subunit S5a and increased co-localization with the 20S proteasome. We conclude that interaction between UbD2 and p97/Atx3 mediates retranslocation of UbD2 to the cytoplasm for terminal degradation in the proteasomes, a pathway that is accelerated by exposure to T4. D2 is retrotranslocated to the cytoplasm and proteasomes via p97/Atx3 complex.